It's less than a week since The Rev. 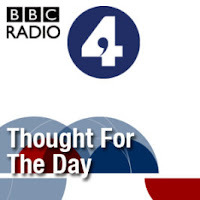 Dr. Giles Fraser, Canon Chancellor of St. Paul's Cathedral, informed us on BBC Radio 4's Thought for the Day that America's financial problems were foreshadowed in the Garden of Eden. Now he's berating politicians for using fancy phrases that don't mean anything. Not that theologians would do anything like that, of course — though Giles does acknowledge dismissals of theology as "unrealistic stargazing" and "the musings of unworldly philosophers with their heads in the clouds". However, says Giles, "...theology, like blue-sky thinking, is the attempt to see things in the widest possible context." Or to put it in a way comprehensible to the ordinary bloke and blokesse (that is, those who are so lacking in the finer subtleties of academe they can't tell exegesis from hermeneutics), theology is like a zoom lens pulling back to its widest setting. That's right, theology lets us see everything. But just in case said bloke and blokesse get a bit cocky by being shown how easy theology really is, Giles tosses in a snippet of Latin to keep them in their place. Lest we think he's off on a flight of fancy, he warns us, "Of course the practical minded are not wrong to worry that all this abstract reflection can easily slip its anchor with reality." Next, to reinforce his cultural credibility he quotes a verse of poetry. By this time we're approaching the end of his allotted three-and-a-half minutes, and though Giles has dutifully included something theological (remembering to dumb it down for the hoi poloi), thrown in some Latin and even some poetry — he's so far not mentioned God. But never fear — the flight of fancy may be postponed but it's not forgotten: God is everywhere! And God is in the details! "One might even say," Giles continues, "that this incarnation of theology of God-become-human is the original localism." One might, but what would it mean if one did? Whatever the "original localism" might be, Giles won't let those stick-in-the-muds obsessed with practical reality blunt our wild speculations. "Indeed, too often, talk of 'being realistic' is just code for a failure of the imagination." Wild speculation, apparently, is essential to politics, just as it is to theology. I think the "practical minded" may be right. Giles Fraser slipped his anchor long ago. Anarchy in the UK — can I blame the Christians?